Heat oil in a deep fry pan and cook the onion until it’s soft and translucent, but not browned. Approx. 10 minutes. Add the garlic and cook a further minute. Add the curry blend and stir while cooking for 2 minutes. Next pour in the tomatoes and vegetable stock, stirring until well combined. 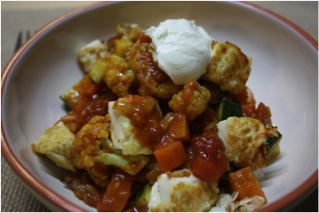 Bring to a gentle simmer before adding the fish, cauliflower, broccoli/zucchini and carrot. Simmer for 8 – 10 minutes or until the fish flakes away easily and the vegetables are cooked. Serve with cooked brown rice* to help soak up all those beautiful flavours and a large dollop of natural yoghurt on top to stir through when eating. Substituting gently fried tofu for the fish is another tasty option I have tried and like.